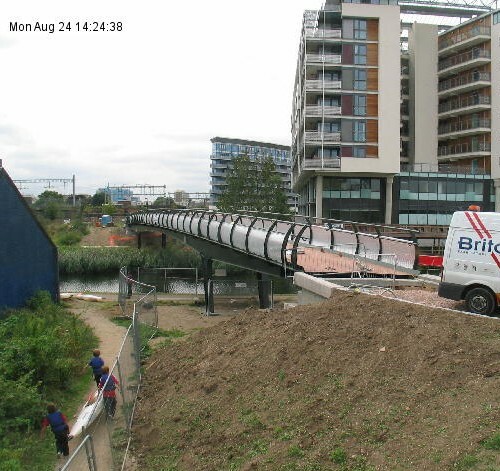 [Updated] I somehow missed this last week (although it received very little publicity) – a new bridge across the Regent’s Canal has just been lifted into place. It’s a foot/cycle bridge, linking the middle of Mile End Park, by the climbing wall and the Palm Tree pub, to the new access road for the Suttons Wharf housing development in Meath Gardens. Once the landscaping works are finished and the bridge opens at the end of next month, this means there’s now an attractive and direct non-road route between Bethnal Green and Bow. Tower Hamlets Council have a webcam looking over the bridge, facing west to Suttons Wharf and the London-Stratford railway line. It seems to update about every minute until around 4pm. I’ve shamelessly pinched one of the photos from it below. The new bridge is particularly exciting for me for a couple of reasons – firstly I’m hosting a street orienteering event in Bow in early September, and this bridge is slap-bang in the middle of the map. Unfortunately it doesn’t look like it will be ready for the event, which is a shame as the bridge will enhance route choice in the area. 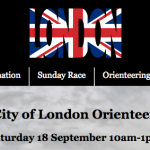 Secondly, it will also allow an extension of my Queen Mary University of London (QMUL) and Mile End Park orienteering map – a test event was run on this map in 2008, and we are likely to have another race on this map next summer or in 2011. In an ideal world, the link path from the new bridge, under the railway bridge to the north end of the university campus would also be opened up – however I suspect this will remain closed for security reasons. I’ve marked on my QMUL orienteering map the rough location of the bridge, in purple, and the access road to it. The bridge is one of the 79 Sustrans Connect2 projects that were set in motion by the charity winning £50 million in the Big Lottery TV competition in 2007.